The past months Joshua Van Dijk (Tausendkraut GmbH) and I were busy planning, benchmarking, designing, developing and marketing the relaunch of the German online shop “Tausendkraut“, which specializes on organic and natural products, and was the first online shop in Germany commercializing Jiaogulan Tea, Chanca Piedra & Mexican Wild Yam. The online shop has grown organically over the past years, the backend was running with XTCommerce 3, which does not correspond to modern software development’s best practices anymore. Modifications and updates were painful and time consuming. Also, the site performance had several critical bottlenecks while, according to Walmart, 1 second of performance improvement increases conversion rates by 2%. Furthermore, the shop had several critical SEO issues, hurting search engine rankings and therefore organic traffic generation. Moreover, the shop usability was not optimal anymore due to the grown product variety, and the overall changed technical possibilities in the past few years. The target audiences can be categorized in different ways. Regarding the user age, we encounter a bimodal distribution. We have a fair amount of younger users (approx. 31% between 18 and 34 years), as well as a very significant amount of older users (approx. 52% of users over 45). The younger users can be generally described as health-conscious consumers, often interested in vegan food and natural supplements because of a general interest in healthy living. In contrast to the younger target audience, the older target audience starts to struggle with health issues, and is often disappointed by the traditional school medicine which is why they might be especially interested in alternative medicine and natural healing products. The third target audience, that is not composed of end consumers, is B2B resellers, such as pharmacies and ‘heilpraktiker’. Because of the level of customisation needed, and the ecosystem of available off-the-shelf solutions for common requirements, the choice for the shop software quickly crystallized into Magento CE. With the use of available resources for templating, payment integrations (Amazon Payments, Paypal, PayOne for Credit Card and Direct Debit payments, as well as payments via invoice for customers with more than 1 order), the project execution was relatively seamless. The migration of ~50.000 orders, customers and products, as well as the corresponding URL redirects was challenging; but with a combination of off-the-shelf solutions and custom code, the migration concluded flawlessly. The final step was the integration of the order export from Magento to the ERP system Amicron Faktura. Unfortunately, the export script provided by Amicron is awfully unperformant: It makes recursive calls to the Magento SOAP API for each order instead of using the provided functions by Magento and is buggy behaving unpredictably, which made a custom implementation necessary. For the launch, we set up a simple site with a maintenance notice, linking to the Tausendkraut shop on Amazon, before pointing the DNS to the new server. For performance and security gains, we added Cloudflare as a CDN in front of our server. To improve mail deliverability, we also set up PTR and SPF records for the domain. After triggering a new crawl of the site via Google Webmaster Tools, we monitored the Google Search Console for Crawl Errors for a few days as it is almost impossible to not get 404 Errors after a relaunch. As the server response time at the time of the launch was not 100% satisfying, we configured the PHP opcache on the server for PHP caching as well as Redis in order to efficiently cache DB queries and user sessions. Due to Magento’s peculiarities regarding URLs, additional configuration was needed to ensure unique URLs and proper canonicalization to prevent duplicate content issues. In the days following the relaunch, we noticed the expected increase in the overall search engine rankings as well as the resulting increase in organic traffic. Despite small problems that were quickly fixed, the customer feedback has been very positive. Joshua and I are very happy about this successful project and the excellent results, and will continue optimizing the online shop now that we have created a solid fundament for further optimizations. 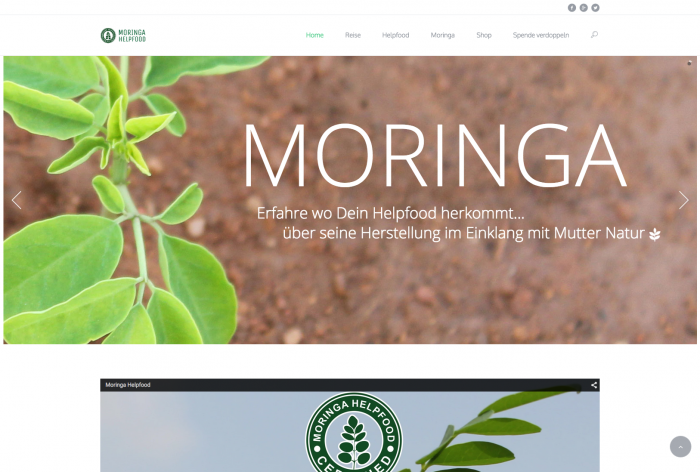 A couple of weeks ago finally it was time to launch Moringa Helpfood, a project on which me, Antje Nücklich (Designer) and Erhan Erasi (Powerpitch Agency, ) and Joshua Van Dijk (Tausendkraut) have been working the past few months. 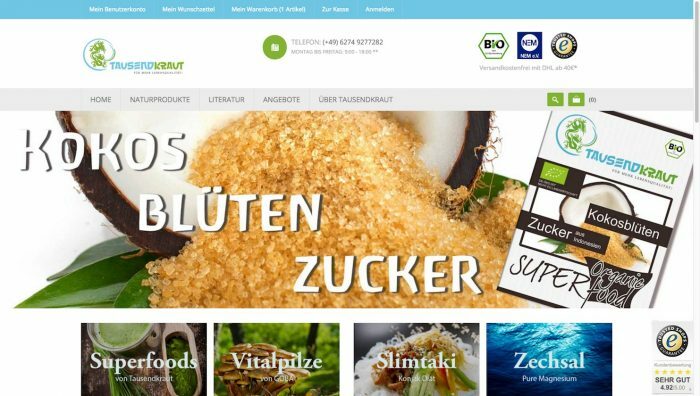 Antje was responsible for the packaging design, Erhan for the explanatory video about Moringa Helpfood, Joshua for the management of the whole project, and my part was the website and online strategy. 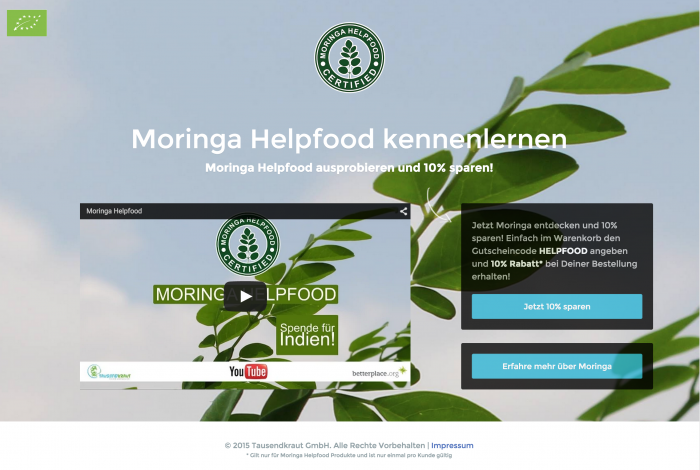 Moringa Helpfood is a campaign of German Online Shop Tausendkraut, which aims to support the local communities in India through the purchase of the Moringa Helpfood, from which with every Helpfood purchase 50 cents are donated to charity. The donations are made through betterplace.org, where transparency about the use of the funds is provided. So I developed a website for the project, and, in order to maximise the reach, leveraging the power of social networks and weak ties. But let’s dig a bit deeper into these two components of the project I was responsible for. So the decision to use WordPress as the website platform was pretty clear, being easy to use for non-technical editors, with a great amount of easily customizable templates available (which minimizes development and time-to-market time), and generally being very search engine friendly. So we looked out for a good base theme, modified and adapted it to our needs, set up the page, created a reasonable site structure, and migrated the content from the previous site. To maximise the reach of the Moringa Helpfood project, the users and customers should be encouraged to share the project over social media, in order to persuade their friends to get to know and try out Moringa Helpfood. Moringa Helpfood inherently includes a 50 cent donation to charities supporting local communities in India. As an incentive to share the content, the donation will be doubled to 1 Euro by Tausendkraut. The amount of total donations is tracked via the sales data, and in order to track how many donations have to be doubled, each Moringa Helpfood product has a unique product code, and a note explaining that with the entry of the code and a share the donation will be doubled. 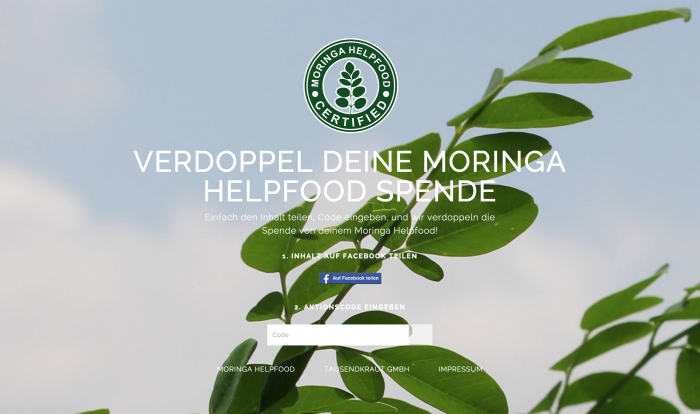 So the customer purchases his Moringa Helpfood, reads on the packaging that the donation of his helpfood will be doubled if he enters the code and makes a share on moringa-helpfood.org/spende-verdoppeln (a landing page crafted to enable the Facebook share, and the code entry), goes to this landing page, shares the content, and enters his product code, which is matched against the database to validate it, and, if valid, keep track of used codes in the database. Then a friend of him sees the shared content on Facebook, a landing page designed to explain Moringa Helpfood with a explaining video, and a call to action to try out Moringa Helpfood with a 10% discount code. The user purchases Helpfood, with a note on the product that a share on facebook, and entering the product code on the landing page will duplicate the donation. The user shares the prepared content on FB (a link to a landing page to try out Moringa Helpfood with 10% discount), this way presents himself as a socially conscious human being, and his friends are driven to the conversion optimized landing page, attracted by curiosity about morniga, and the 10% discount. The Result: A Win-Win-Win-Win situation. The local communities in India raise money and improve the standard of living, the customer doubles his donation and communicates his social consciousness to his social network, the attracted client got to know Moringa Heelpfood, and Tausendkraut increased its reach and sales). 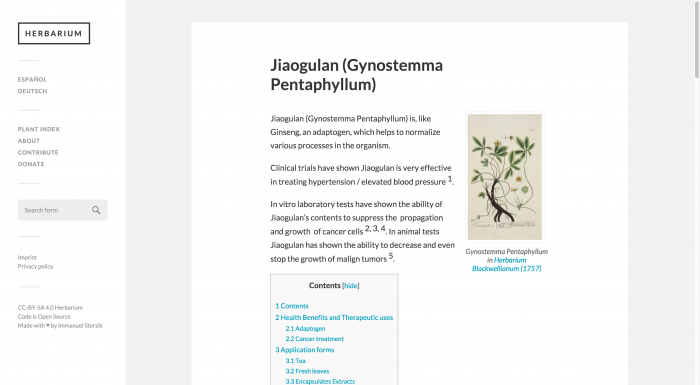 A couple of days ago I launched Herbarium, a free online database about the health benefits and therapeutic uses of medicinal herbs and superfoods. In the past months, I have been researching the benefits of medicinal herbs and superfoods extensively, and noticed that there was not a single trustworthy, simple and serious online information source regarding the contents, effectiveness and uses of medicinal herbs and plants. 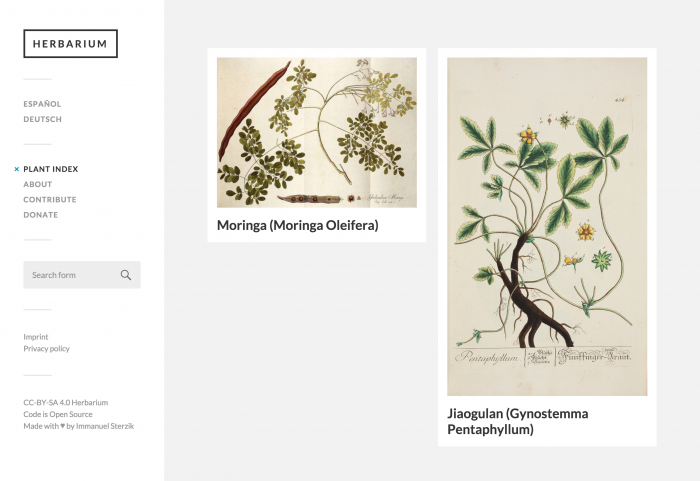 So I decided to put a Minimum Viable Product of Herbarium online in order to provide trustworthy and scientific information on a simple interface, as “the best way to complain is to make things”. For the MVP I decided to use WordPress. WordPress has its advantages and disadvantages for this endeavour, but it provides an effective solution to content management, SEO and multi language support. Ideally, if the MVP gains some traction, I’ll build a custom web app. As for the requirements of the MVP, I decided I wanted to include multi language support from the beginning instead of adding it later at a substantially higher cost. So I set up a project, which you can check out on GitHub. To provide a slick User Experience, I also optimised the website for search engines and frontend performance. In order to optimize the site for search engines I use WordPress SEO by Yoast, which allows the simple setting of page meta title and descriptions, and gives quick feedback about the SEO-readiness of the content. To boost the site performance, I use W3C Total Cache, which allows to set up things like Page Caching, Object Caching, Database Caching, Browser Caching, a CDN, and JS/CSS Combination & Minification. The next couple of weeks I will continue to add new plants and complement the information, starting with the most common herbs, and then expanding over to the less known.